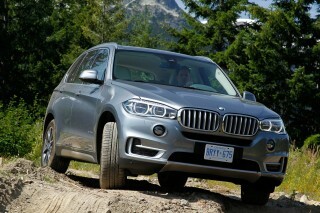 Those 20-inch wheels look great, but they detract from the XC90's smooth, comfortable ride. The 2014 Volvo XC90 is a luxurious, smart choice for families with priorities on safety and comfort, though it isn't exactly cutting-edge anymore. 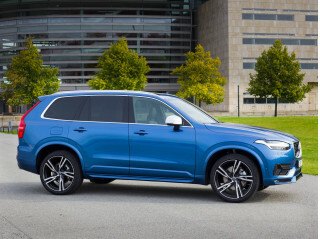 The Volvo XC90 is one of the older crossover SUVs on the market, but it's still a favorite for families that put safety and prestige on about the same level. Though it was new in 2003, and hasn't been updated substantially since, it's one of the safest vehicles you can buy. You'd never guess its age from its exterior, features list or driving dynamics, though. In fact, the XC90 has more technology now than ever before, and it's a great choice for families who need as many as seven seats. While Volvo updated the exterior look of the XC90 yet again in 2013--with a new body-color bumper-and-trim look, new bumper brightwork, and LED running lamps and taillamps, all of which make this model look more carlike once again--the XC90 does show its age inside, where it still shows the design direction of Volvo before it went to more minimalist layouts and thin-panel controls (as you'll find in the S60 and XC60, among others). This year, the 2014 XC90 3.2 gets the executive c-pillar emblem and floor mats, the folding front passenger seat, 19-inch "Galateia" wheels and the option for the upgraded Sovereign leather. The R-Design model also receives the Homelink garage door opener and digital compass and the new Crystal White Metallic paint. All-wheel drive is now a stand-alone option, as is the Blind Sport Information System, dual-screen rear seat entertainment system, the Red wood steering wheel, and the 19-inch Galateia wheels. The XC90 performs as well as you might expect from a family-oriented crossover, but there's no reward here for driving enthusiasts. You'll find plenty of power from the 240-horsepower, 3.2-liter six-cylinder engine and six-speed automatic (the V-8 was discontinued last year and is a fading memory), and it's an exceptionally smooth combination with the six-speed automatic. Yet the XC90 just isn't much fun to drive; it's mostly a matter of the detached feel of the steering, even though quick maneuvers are safe and sound. Synthetic motor oil is standard on all XC90 models; it extends oil-change intervals to 10,000 miles. Thanks to three rows of seating, the XC90 can accommodate up to seven and is a good alternative to either the more trucklike SUVs or a well-optioned minivan. This model still lives up to Volvo's reputation for excellent seats--especially in the first two rows--and they're worthy of all-day drives. The third row can be hard to get to for all but the smallest kids, but the second row feels comfortable and shaped for adults. The interior is as reconfigurable as any large family might hope for; keep the third row down and you'll generally have lots of space for larger grocery runs. Additionally, the ride quality is smooth and stable, with less pitchiness and side-to-side motion than in many other crossovers. For 2014, the softer Sovereign leather is available as on option on the entry-level 3.2 model. Safety is of course a top priority in the XC90, and this model hasn't let us down in any way. 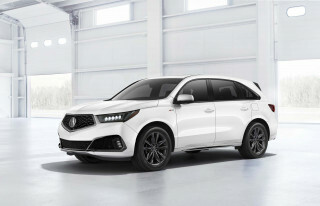 It's been a repeat IIHS Top Safety Pick, and in addition to the usual roster of features, there's rear park assist, and an available Blind Spot Information System (BLIS) to warn you of nearby vehicles. 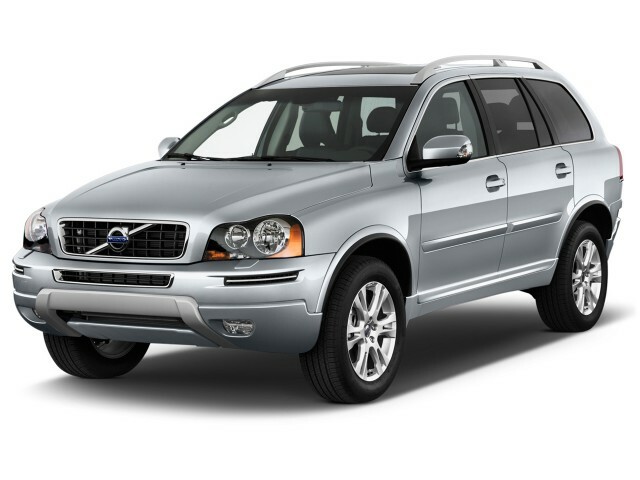 An aged look puts some distance even between the XC90 and newer Volvos. The Volvo XC90 has essentially gone unchanged since its debut in 2003, making it one of the oldest crossover designs on the road today. Even so, it still looks reasonable fresh, due in part to a handful of minor refreshes over the years. 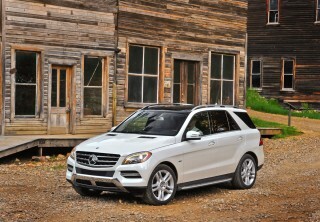 Thanks to mild updates for the 2013 model year, the XC90 continues to look current in today's luxury crossover segment. There are front and rear body-colored bumpers, updated side molding, silk-matte side mirrors and standard LED daytime running lights. There also are white interior lights–rather than previous models' minty green–as well as silver or red wood inlays, but there's no question that the XC90 shows its age most from the inside. Volvo's 'floating' center stack found on other models isn't present–there's just a two-tone instrument panel instead. Competent handling is on the mark, but there's nothing here to get excited about. The 2014 Volvo XC90 isn't exciting to drive, but it's not necessarily meant to be. 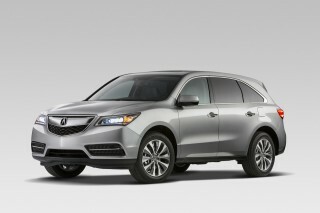 Instead, it's a confident all-weather performer that keeps family comfort and convenience in mind. There's only one drivetrain available: a 3.2-liter in-line six-cylinder engine that produces 240 horsepower and 236 pound-feet of torque, paired with a six-speed automatic transmission. It's available as either front- or all-wheel drive, and there's a Haldex 'Instant Traction' option available for the all-wheel-drive system. In general, the XC90's powertrain feels lively and smooth, with strong pulling power and an engine that's happy to sing up the rev range. Unfortunately the handling doesn't feel the same way; it's responsive enough, but never engaging, and you'll be aware of the XC's heft. But it's a safe handler and never feels unstable or tipsy, even with riders in the third row. The XC90 spawned a generation of sedans and crossovers, and its comfort and space are still competitive. The 2014 Volvo XC90 may be one of the smaller seven-seat vehicles on the market today, but it's focused on passenger comfort, thanks to its car-based design. That makes it a solid choice for shoppers who might otherwise choose a minivan or truck-based SUV for their family-hauling needs. Comfort itself is great, thanks to good ride quality, with less pitchiness and side-to-side motion than in many other crossovers, and cabin materials are impressive, providing plenty of pleasing soft-touch materials, even though they're a little stark at first glance. For 2013, XC90 Premier Plus and Platinum models get softer Sovereign hide seating surfaces as standard equipment. The front two row of seats live up to Volvo's reputation for exceptional comfort that won't leave you achy after a day's worth of driving. It's easy to get in and out of the XC90, too, thanks to its wide door openings and tall ride height. The third row, while it's doable for adults—and it definitely works for those occasions when you need another position to get another couple of children home from practice—isn't all that spacious. Entry and exit to the third row is more the issue than the space itself, as the second-row seats can be adjusted forward to help. Fold the third row forward, and cargo space can be expanded to a flat 85 cubic feet. It's been an IIHS Top Safety Pick, but the XC90 hasn't been tested lately by the NHTSA. As safety has become more and more important to shoppers in recent years, the national organizations that rate vehicle safety have designed more rigorous tests to make vehicles safer than ever. Even so, Volvo has essentially owned the torch for car safety for decades now. The XC90's IIHS Top Safety Pick status has gotten even better for 2014, as it's been subjected to the small-overlap test that now gives it the Top Safety Pick+ designation. The federal government still hasn't tested the XC90 under its revised test method, though. So what separates Volvo models like the XC90 today? You can be sure that the XC90's structure and features as as protective as its rivals, and even though this is hardly a fresh design Volvo has made sure that there's an impressive set of safety features—including front side and side curtain airbags, anti-lock brakes with electronic brake distribution and brake assist, stability and traction control, roll-stability control, rollover mitigation, and finally, rear park assist. The Blind Spot Information System (BLIS), which warns of vehicles in the blind spot by flashing indicator lights within the cabin, is available. Luxury and convenience features are on par with the crossover class--and should be, at these prices. The Volvo XC90 has added features and equipment over the years, and despite the vehicle's aging design, the new technology has made the SUV a seemingly better and better value over time. The XC90 goes mostly unchanged for 2014. Last year, it received standard LED taillights and daytime running lights, headlight washers, rain-sensing wipers, a new trims and finishes. Bluetooth hands-free connectivity is standard on all versions of the XC90, as is Sirius Satellite Radio. 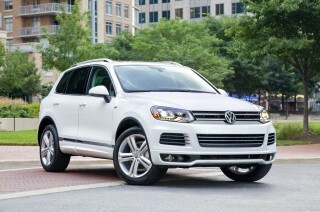 There's also standard leather seating, cruise control, dual-zone climate control and keyless entry. Premier Plus and Platinum editions add more equipment, and a Climate Package brings heated front seats and an upgraded climate system. The Premier Plus gets active dual xenon headlights, a garage-door opener, and other upgrades, while the Platinum adds rear park assist and premium sound. A dual-screen rear-seat entertainment system remains available, while the optional navigation system comes with real-time traffic and a rear park-assist camera. Heated front and rear seats, massage and ventilated front seats, and other appearance upgrades can be had with Premier Plus and Platinum models. Below those, there's also a sporty R-Design package that nets you a number of cool items such as sports seats, brushed aluminum trim, and a fresh "Ixion" wheel design. Gas mileage isn't anything special with the XC90. The Volvo XC90 isn't what we'd call a gas-sipper. 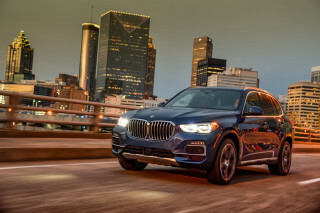 If one of your top priorities is excellent mileage, you might want to steer over to the likes of the Lexus RX 450h or Mercedes-Benz ML 350 BlueTEC; both of those models go significantly further per gallon while offering a comparable amount of space (though neither has three-row seating). With that in mind, the 2014 Volvo XC90 isn't a gas-guzzler, either. According to the EPA, the XC90’s fuel economy is listed at 16/23 mpg city/highway, and 19 mpg combined, though we've noticed those figures can easily deteriorate with even a little hard driving. Opting for the all-wheel-drive model decreases the highway fuel economy by 2 mpg, and we recommend it for this system's excellent snowy-weather ability. Looking for a different year of the Volvo XC90?